PPL Fitness provide a variety of entertainment options for your gym or fitness centre to meet a wide range of needs and budgets. The new MYE LED Digital TV features a brilliant high definition energy saving viewing experience. 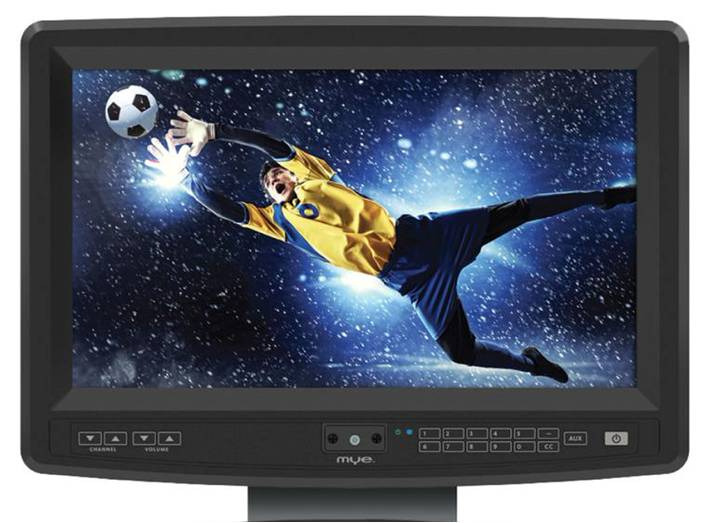 MYE commercial grade TV technology is the most trusted in the industry and featured in many leading fitness manufacturers TVs. MYE Cardio Machine TVs are designed to easily replace your obsolete TVs. Visual Headphone Jack Alert - signals need for replacement. Energy Saving Sensor - automatically turns TV off when not in use. No attachable TV Controller required. The MYE Consumer Grade Cardio Machine TV with Attachable TV Controller is a perfect solution for facilities looking for a lower cost replacement for BroadcastVision, CardioVision and other consumer grade cardio machine TVs. ATSC / NTSC digital tuner. SportsArt manufactures a full range of customized brackets for every piece of cardio equipment. Entertainment brackets provide a clean look for your aftermount TV system. Adjustable screen holders from 15" to 19" screens. Entry and exit holes to hide cables and wires. The new MYE Club TV Digital Transmitter delivers exceptional value with exclusive features including digital audio input, energy saving channel selectors and the industry’s longest warranty. SportsArt cardio equipment feature intelligent MYE wireless TV audio receivers built into select machines for a convenient, all-in-one entertainment experience. Exercisers simply plug their headphones into the machine console, select the desired TV and enjoy. MYE built-in wireless receivers are designed to work with Cardio Theater, MYE and other brand transmitters for seamless comparability. Cardio machines with integrated MYE wireless receivers provide audio from any ceiling or wall mounted TVs connected to TV audio transmitters. Simply plug in headphones, select the TV on the console and enjoy. Fitness Manufacturers #1 Choice – The official transmitter selected by SportsArt and others. Works with All TV Receivers – Works with the best selling MYE Eclipse receiver, Cardio Theater and all other brand receivers or integrated MYE TV receivers on select cardio machines from SportsArt and others. Quick Lock Energy Saving Channel Selectors – Transmitter channels are only set once during installation! No energy wasting large LED displays that are constantly ON for the life of the product as offered by our competitors. Save up to $100 on Each Transmitter – New MYE Digital Audio Input eliminates the cost of digital converters required with Cardio Theater xTV-9 or other analog only transmitters connected to new digital TVs without standard analog audio jacks. Multi-Transmitter Combiner – Provides simple solution for combining multiple transmitters on a single antenna for satellite or cable boxes installed away from your cardio area TVs. Simple Replacement and Install – Transmitter includes MYE, Cardio Theater and all other brand transmitter channels for easy replacement or the installation of additional transmitters on existing wireless systems. Standard Analog Audio Input – For traditional TVs with analog audio outputs. 5-Year Warranty – Absolutely the best warranty in the industry.